Cappuccino? Latte? Hot milk with lots of sugary syrup and virtually no coffee at all? You've got it! 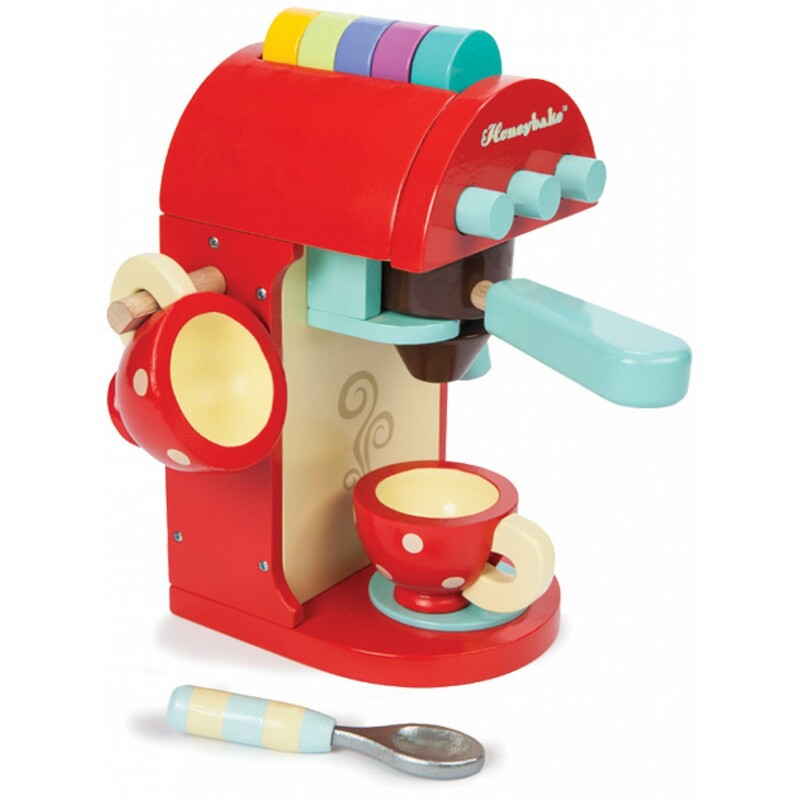 Now thanks to our friends at Le Toy Van, your little Barista can make their coffee to order, with the brilliant Honeybake Cappuccino Machine. With cups, spoons, a milk frother and five interchangeable coffee pods to choose from, the queue for delicious coffee will rival the one in Cafe Nero Brentwood! Now, can we please have a Babyccino? This is a really striking set, that looks as good as it plays, and blends seamlessly with the other products in Le Toy Van's Honeybake range. There's lots of authenticity - the blue buttons at the top of the Cappuccino machine can be pushed in, the coffee pods are all colour coded and fit perfectly in the filter and the milk frother looks just like the ones they use in a coffee shop. This is a really well conceived and very good looking toy - we love the way the coffee pods all neatly store to become part of the colourful and striking design. Le Toy Van products are made from various materials, including and non-toxic paint.